This week we put the spotlight on our smallest app star, Rockstar the Pangolin. Don’t let her name fool you. Rockstar is shyer than most other Temminck’s pangolins of the Tswalu Kalahari Reserve, and likes to stay close to the creature comforts found in her area of the sand dunes. Like all pangolins, Rockstar curls into a ball so that her scales can protect her from predators. Sadly, it is these scales that make her species vulnerable to poaching. Rockstar is safe at home, however, as the Tswalu Foundation and University of Witwatersrand work to protect her from threats such as illegal trafficking and climate change. Wendy Panaino, researcher at Tswalu Foundation, is really close to Rockstar through her work. "Rockstar is relatively shy when first approached. However, the more time I spend with her, the more she starts to warm up to my presence and goes about her nightly business as usual the longer I’m around. She does not stray too far out of her home range and she tends to choose burrows that occur on the same dune strip. The other study subjects utilize burrows across many dunes and habitats." 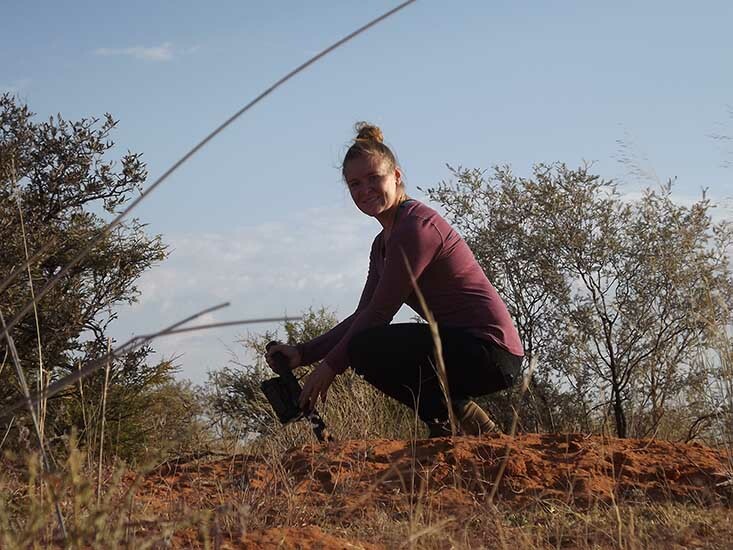 Researchers like Wendy locate the pangolins in their study area at least once a week, using VHF (Very High Frequency) telemetry. This technology allows a tagged animal to be detected from far distances. Once a pangolin’s burrow has been found, a camera trap is placed just outside its entrance in order to snap pictures of its activity. Tracking allows researchers to learn about many behaviours, such as preferred feeding locations and daily travel patterns. BABY ALERT! In November of 2017, Wendy spotted Rockstar with a 2 month old pup on her back! Wendy sent us this message: "Hey SC team! Super exciting news!! !😀 I've recently learnt that Rockstar the pangolin has a 2 month old pup. 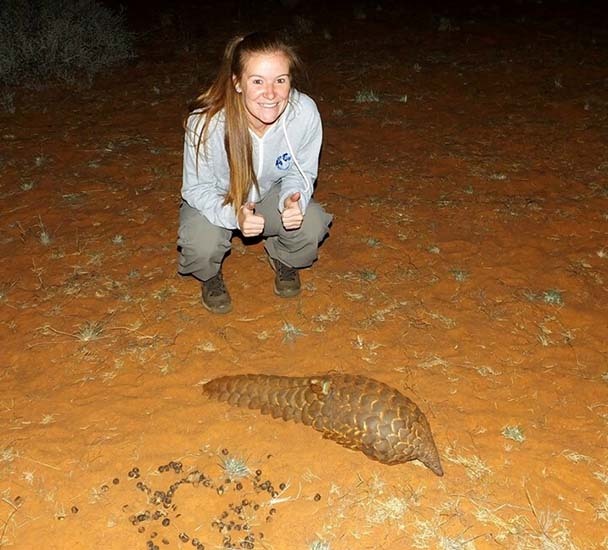 Pangolin moms generally only bring their pups out roughly once a week when changing burrows, so I was incredibly lucky to catch them in the act." We are sooo pleased! Though typically thought of as a desert, the Kalahari region is covered in a wide diversity of vegetation types, ranging from the semi-arid savannas of the southern regions to the dense forests of Zaire. Tswalu Reserve, in South Africa, is arid savanna habitat consisting of undulating dune fields. These are occasionally interrupted by ‘Korannaberg hills,’ areas of higher elevation which receive higher rainfall than elsewhere in the Kalahari, leading to additional habitat diversity. The Reserve also extends into the southern, or “Green,” Kalahari, where the climate spans the extremes. In winter, temperatures fall well below zero, while in summer they will often exceed 40 degrees (C). This climatic and geological variability has led to the evolution of a wonderfully diverse suite of animal and plant life, much of which is still little-known to science. Among the many species that occur in the Kalahari, there is one very charismatic species that clings on tenaciously in this unforgiving environment – the Temminck’s ground pangolin. Do you want to play around with Rockstar yourself? Download Safari Central from the App Store or Google Play!